At 7 PM the exhibition center's doors opened and hordes of journalists broke through the velvet rope line holding them at bay. They rushed down broad, carpeted hallways, deftly ignoring the staff's pleas for calm and demands for proper identification. There was no time for pleasantries that night: It was a land rush, with limited table space and access to the precious few Ethernet connections. Welcome to the Pepcom Digital Experience, where exhibitors and reporters alike jockey for the other's attention in hopes of scooping their competition. It's madness, enough to drive a man to drink. So that's exactly what I did. But where's the fun in getting soused -- on the clock and in front of my bosses, natch -- unless I can keep score? That's where BACtrack's newest alcohol monitor, dubbed the Skyn, comes in. It continuously monitors the amount of ethanol molecules escaping through the skin and provides near real-time readings to its associated iOS app. So, rather than blow into a breathalyzer, as one would at their local DUI checkpoint, all you have to do is glance at your phone. 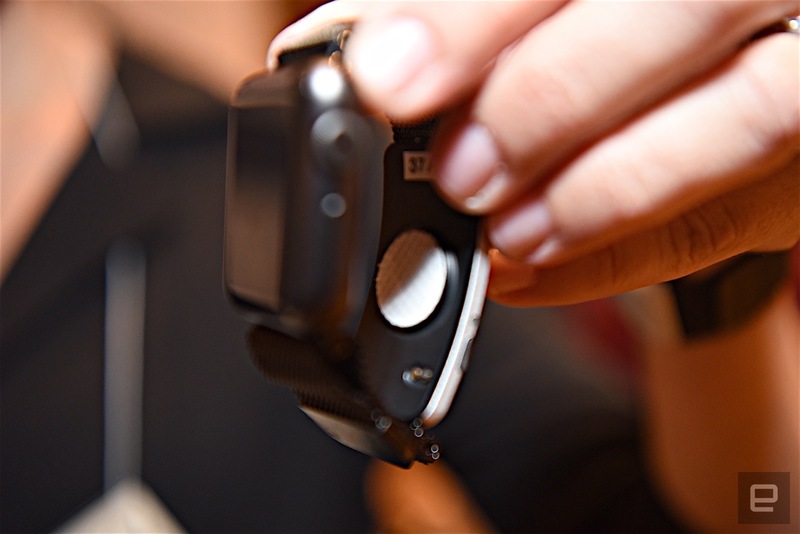 The Skyn can also be integrated with the Apple Watch, replacing the normal band. Now, this device doesn't provide a Blood Alcohol Content (BAC) rating as conventional breathalyzers do. 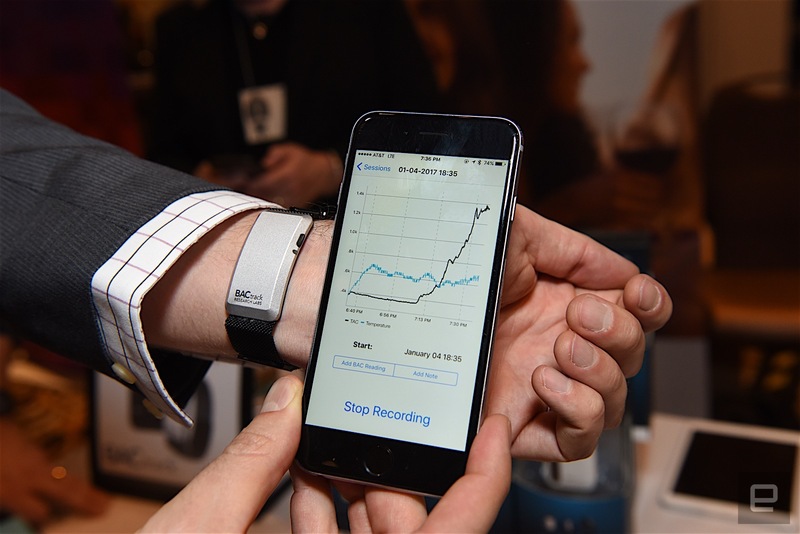 Instead, it measures a person's Transdermal Alcohol Content (TAC) from the inside of their wrist. The company is still working on an algorithm that will convert the continuously generated TAC into BAC, which estimates your level of inebriation for a given moment in time. Currently, the system only spits out a .csv file with the accumulated raw data so, for that night, I was left counting drinks and making my own inferences to compare against a breathalyzer test scheduled for the end of the evening. Since this was technically a work night, I decided to start off slow and slugged down a vodka and Coke on the way over to the BACtrack table to pick up the Skyn. The company's reps gave me a quick run-through of its functions before pairing it to a iPad, strapping it to my wrist and sending me on my way. What's nice about the Skyn is that you don't necessarily need to keep it within Bluetooth range of your phone or tablet. It can store an evening's worth of data onboard and download it to the mobile device later. In this case, the iPad stayed at the BACtrack table. Over the next two hours, as I bobbed and weaved my way through crowds of technology gawkers, overzealous PR reps, booth babes and cocktail waiters, I developed something of a system. On my way from the press table to a given exhibitor's booth I'd drink a cocktail, either a Ketel and Coke or one of the event's themed martinis -- both of which contain anywhere from 1.5 to four ounces of liquor. After visiting my target booth, I'd return to the press table and eat a single serving of hors d'oeuvres: either a toothpick's worth of andouille sausage or a couple waffle fries. By my count, I visited eight separate booths over the course of the night. That translates to eight cocktails, at least two full andouille sausages and 16 waffle fries. I did also sneak two glasses of unadulterated Coke when I felt myself getting overly tipsy (hey, I gotta stay professional, people) just to keep myself in check. When the event ended, I sauntered to the BACtrack booth to return the device and take my breathalyzer test. I had stopped drinking 20 minutes beforehand (as is required for breathalyzers) and wound up blowing a .06. That's lower than the .08 limit, which would have earned me a DUI had I gotten behind the wheel of a car (seriously, don't drink and drive), and half of the .12 that I had initially guessed. Again, though the data output from the Skyn were simply raw measurements rather than a more easily interpreted BAC, the data's graph shows a steady progression of intoxication as well as spikes whenever I downed a drink. So this device clearly works, but whether it's as accurate as a conventional breathalyzer remains to be seen. The company plans to release the Skyn for sale at some point this year, so it has a bit of time to get the system in proper working order. Hopefully my liver will have recovered by then.